One of the happier facts I brought home from an otherwise very frustrating run for President was this: most Americans feel a lot better about how their cities, towns, and local counties are governed today than they did just fifteen years ago. Getting things done. Bringing people together. The great promise of effective governance in the Information Age is not so much that the data allows us to manage the masses but rather allows us — if we care — to recognize the needs and dignity of every individual person. If a lack of trust is the greatest political challenge we face as a nation, perhaps City leadership provides the way forward in these politically challenging times. These times: when a majority of our people — for the first time — now live in cities. These times: when the clustering of intellectual assets, creativity, economic opportunity, and innovation in cities gives rise to tremendous new possibilities for the future of America’s cities. These times: when wealth is hyper-concentrated in the hands of the very few, when job opportunities continue to decline for our citizens without skills or college degrees, and when the fires of despair and deep political divisions threaten to tear us apart as a people. No American City can separate itself from this reality, but take heart and be not afraid. All things in this life are temporary — especially in politics. Politics is never static. It is always dynamic. Every Administration passes, changes and is no more. Looking at the electoral map of the most recent Presidential election, it is easy at first glance to see a continent of red punctuated by dots of blue. 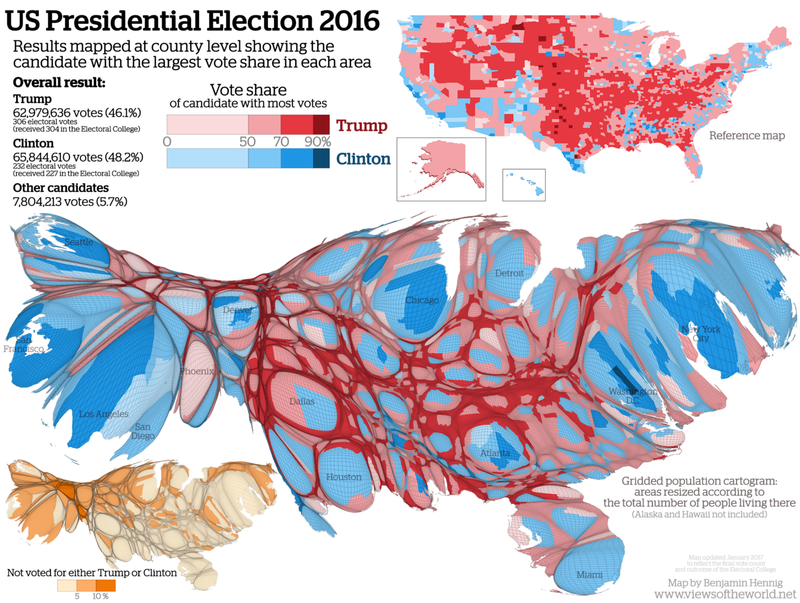 But when that map is adjusted by where the greatest numbers of Americans actually live, what emerges is a map of blue bubbles with deep red spaces in between. In the days ahead, the blue bubbles of our nation’s metro economies will grow larger. Urbanization, like climate change, is very real, and there will come a time when progressive and inclusive leadership returns to the White House. One day there will be a new urban agenda for our country. A national cities agenda to harness and invest in the enormous possibilities our cities hold to advance our common good as a country. To uplift the dignity of every person and the dignity of work. To make real the promise of greater opportunity for all. This agenda will include investments in the talents and skills of our people. Investments in transportation and affordable housing. Investments that connect our people more closely to each other and connect our children to the opportunities of the future. State preemption of the freedom of cities to shape the nature of their metro economies. The nationalization of local public safety functions and the criminalization of new American immigrants. The undermining of the sustainability imperative that holds such promise for city residents, city living, and life on this planet. Today, we might add that economic freedom also means freedom from “low wage fundamentalism” — the sort of trickle-down economics that has led to a shrinking middle class, reduced consumer demand, and stagnant wages. The “corporate bottom-line economics” that would have all of us pretend that consumer spending doesn’t matter when in fact it is the driver of American capitalism. State Preemption: the recent efforts by some states and, likely soon, the federal government — to place limits on the freedom of cities to enact wage and labor policies that promote upward economic mobility — is bad for our country and bad for our cities. Author Richard Schraeger in City Power notes that many city leaders across America have raised the minimum wage, expanded social services, put conditions of inclusion on incoming development, and otherwise engaged in policies designed to lift people out of poverty and grow a more upwardly mobile and inclusive middle class. Cities are showing they have more power and more latitude in this regard than previously thought. There is a powerful American truth at the core of this movement and it is this: Our economy isn’t money, it’s people, all of our people. The more our people learn, the more they earn. The more they earn, the more they can spend. The more they spend, the more our economy and shared quality of life expand. Cities that have taken local action to raise wages have not suffered from capital flight. On the contrary, they are accelerating their own economic renaissance. One of the greatest governing success stories of modern American history, is the degree to which so many cities have figured out how to improve public safety. Cities, for the most part, are safer and better governed today than ever before. There are exceptions to the rule. Some cities haven’t yet figured it out. Sadly, my own hometown of Baltimore chose to forget a lot of hard-earned lessons learned about crime reduction. But all across the country, cities large and small are making themselves safer. Comstat, or “goal oriented community policing”, has saved thousands of American lives in cities all across our nation. In some places, the improvement in policing continues as more and more lives are saved. New York and Los Angeles in particular have figured out how to improve public safety while, at the same time, improving public trust — the basis of all security for any free people. This life-saving progress is being threatened now by the Trump clampdown on so-called “sanctuary cities” by their unconstitutional efforts to nationalize local police and jail functions and turn them into agents of an unprecedented national immigrant roundup. Mayors must stand together and push back with every legal and political means at their disposal. Cities can win this argument not only in courts on Constitutional grounds supported by the Tenth Amendment, but also win this argument with the American people on the basis of what works to improve public safety. The truth is public safety declines when people are afraid to call or work with the police. Public safety breaks down when we create an underclass of people within our society — whether by race, religion, geography, or their limbo status in a broken immigration system. Today’s new American immigrant families cannot get in a line because for them there is no line. Mayors understand better than most elected officials the energy, optimism, and love of country that our new American immigrant neighbors bring to work every day. Mayors understand that our diversity is a creative asset, an economic asset, and — when embraced — a security asset. Mayors are very often the most credible political voices in every metropolitan area especially where public safety and homeland security are concerned. Mayors need to use their leadership credibility to stand up for the truer, more compassionate, and more generous country that we carry in hearts. Climate change is the transformation that changes everything. In the absence of Congressional consensus, states and cities are leading the way on addressing the reality of climate change and seizing the job creation opportunity of transitioning to a clean energy future. All of these things are prodded forward by states supported by the people of America’s cities. There are more jobs in a nascent solar industry today than there are in coal. More jobs in solar than in oil and natural gas extraction. In the swing state of Iowa, 35% of their energy now comes from wind and increasingly more of the big parts for that domestic industry are manufactured in the Midwest as well. The advances happening in our built environment with net-zero homes, and living buildings hold tremendous potential for job creation, health, prosperity, and productivity. With gag orders being issued to our nation’s scientists and environmental administrators prohibiting them from even using the phrase “climate change”, cities and more enlightened states must lead the way. The future of cities and this planet are now joined in one urgent movement of human development. The future we seek is not a future of less, but a future of more. Not a future doomed by a willful disregard of physics but a future led by living cities. Cities that are re-imagining and redesigning the way we coexist with — not at the expense of — the other living systems of this earth upon which all our lives depend. We have lost White House leadership on climate change for a time, but that doesn’t mean we have lost the leadership of Americans. A big part of the answer to climate ignorance in the White House, is climate action by our cities, states, and individual citizens at the local level. When I was elected Mayor in 1999, my city, Baltimore, had become the most violent, addicted, and abandoned city in America. At one of our first community meetings in a hard hit neighborhood of East Baltimore, citizens assembled with me, their new Mayor, to talk about crime and public safety. About justice and racial injustice. There was tension in the air. A fear about what might be. A little girl came up to the microphone. There is a relationship, a symmetry, between how well we govern ourselves and how much trust we one another. An inseparable relationship between the two. They can reinforce each other, build each other up, or drag each other down. Mayors understand: Progress, is a collaborative enterprise. Collaborative leaders bring people together in common cause. That cause is American progress. And I am betting, America’s cities will paint a brighter future for all against the dark canvas of today’s national politics.